Mabel confesses: "Beets are so delicious, and their overwhelming red tends to get everywhere. I let my imagination run one night as I was preparing a big, juicy salad, and that's how this poem began." 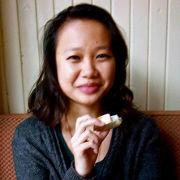 MABEL LEE is a poet and foreign language enthusiast who has recently returned to hometown Philadelphia from a teaching career in Madrid. She has been published as part of the Sips Cards poetry and short story initiative and is also the editor of the e-zine The Plum Plum. She enjoys blogging, reading, yoga, and long bouts of laughter, as well as traveling to far corners of the earth.